It's that time of year again - the time where fuzzy green balls are flying about in London and everywhere is full of 'love.' That's right, it's Wimbledon 2017! Whilst I used to be a big fan of playing tennis, I've never really been into watching it, but one thing you've got to love about Wimbledon is the strawberries. I'll talk a little bit about the history of strawberries at Wimbledon (I listened to an interview with a lady who owns one of the farms that they're bought from on the radio, that's how much I love this tradition), but just to give you a rough idea of how many are consumed, around 140,000 servings are given out over the course of less than 2 weeks! 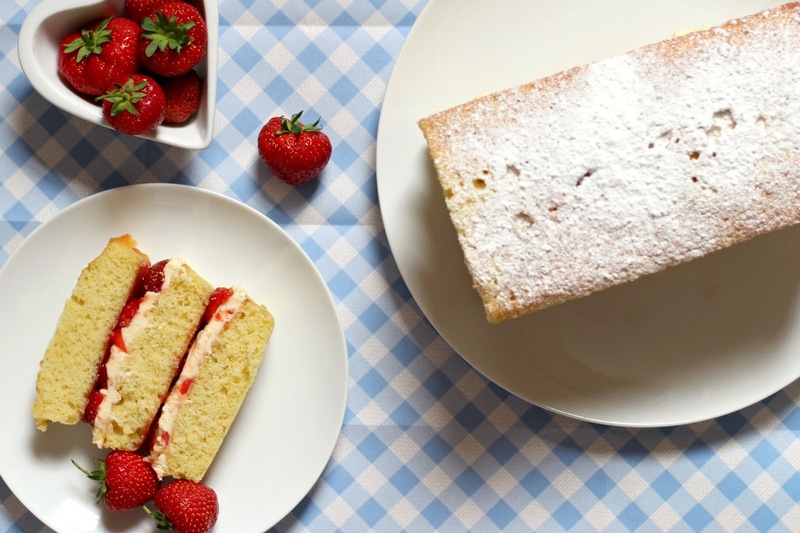 I was feeling inspired by all the tennis, strawberries and downright British-ness, so I've whipped up this Victoria Sponge loaf with three layers for the ultimate tennis-watching treat. The tradition of eating strawberries and cream at Wimbledon dates back to Victorian times, but no one can really put their finger on how it came to be 'the thing' to do each year. However, Wimbledon is held in the early summer, which is the time of year that strawberries are in season, and in the wealthy Victorian circles, strawberries were probably seen as a very high class and fashionable thing to eat. That's my guess as to why this tradition has been around for so long, but I could be totally wrong! All of the strawberries are grown at select farms in Kent and are picked the day before serving at about 5:30am to ensure freshness. Along with the 140,000 servings, the tournament sees about 10,000 litres of fresh cream consumed too! 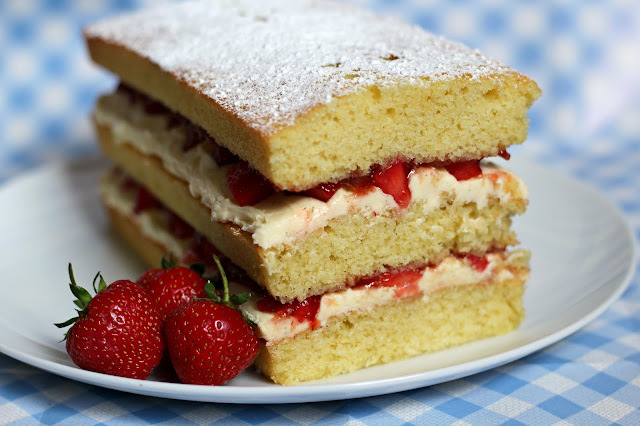 Of course, this isn't the only food served at Wimbledon, but it is certainly one of the most popular, which is why I decided to incorporate strawberries into the quintessentially British tea-time treat. I also decided to go against the grain and create a loaf. I found myself in the York branch of Lakeland just the other day, and they just so happened to have a sale on. I ended up leaving the shop with the Wilton Easy Layer Loaf Tins - I saw them sitting on the shelf and I just couldn't stop thinking about all the different things I could make with them. Ombre loaf, anyone? But it was J that suggested I do a Victoria Sponge with them for Wimbledon. I must've been banging on about strawberries and wanting to do something so much, but it was a brilliant idea! Using the layer loaf tins would mean that you'd be able to see all the goodness inside and the oozing strawberry juice as you cut into it. I wanted to capture all the British goodness that comes along with Wimbledon, so I already had the Victoria Sponge idea, the strawberries, but I also decided to fill the smooth buttercream with vanilla seeds to replicate the cream that the strawberries are served with. You all know I love me some vanilla, so how could I not? In a large bowl, beat together 225g of the butter with the caster sugar until the mixture becomes and light and fluffy. Gradually add the eggs, beating after each addition, then beat in the vanilla extract. Once the mixture is just combined, scoop it into each tin evenly, spreading it out with the back of a tablespoon. Pop each tin into the oven and bake for around 15 minutes. When baked through, remove the cakes from the oven and allow them to cool in the tins for 10 minutes before transferring to a wire rack to cool completely. Whilst your cakes are cooling, you can make your icing! In a large bowl, beat the remaining 200g of butter to soften it further. Gradually beat in your icing sugar until you have reached your desired consistency. If you'd like to loosen it up, add a splash of milk or add more icing sugar to thicken it up. Mix in your vanilla seeds, then you're good to go. Once your cakes have cooled, evenly spread some vanilla icing on top. Cut up some of your strawberries into small pieces and pop them on top of the icing layer. Take your next cake and spread some strawberry jam on the bottom before sandwiching it on top of the strawberries and icing. Pop icing and strawberries on to the top of the next cake, then sandwich the last cake with a layer of strawberry jam on the underside on top. Finish the whole thing off with icing sugar sieved over the top! I'm so bloomin' pleased with how this cake turned out, but of course, because of the fresh strawberries, it won't last all that long. That won't be a problem though - it's just too tasty to ignore! This would also be delicious with raspberries and raspberry jam, maybe with a little bit of white chocolate thrown in to the mix. Even though I don't much about tennis, I really hope that everyone is enjoying Wimbledon so far! Turned out really well for you - love a victoria sponge so I do! !